Interactive maps can be real assets to your organisation, fulfilling a variety of needs and helping to paint a picture of the landscape for your end users. Here at ExtraDigital, we have a wide range of experience creating interactive maps to help fulfil your map development requirements. We use a variety of different mapping platforms, including Google Maps, Bing Maps and Open Street Maps. Ensuring that the correct solution for your application requirements are met and creating accurate polygons to reflect data points such postcodes, districts and boroughs. Our map development clients include several organisations from government agencies to private companies. 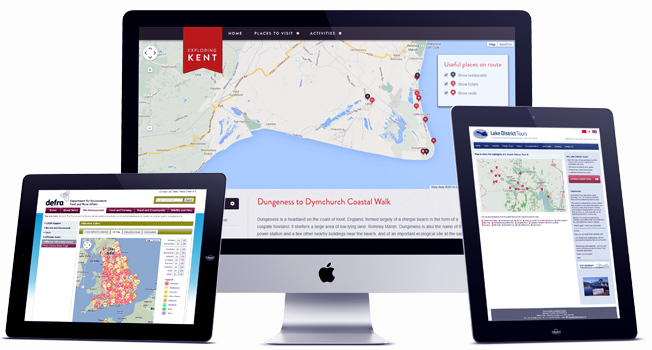 Their requirements vary between bespoke systems to collect and map data across the United Kingdom, to wishing to accurately map out multiple postcode areas or points of interest for their clients and prospective customers. As with all our application and website development, we combine our experience of creative and responsive design with our knowledge of building scalable user friendly systems. This creates mapping solutions that present information in more interesting and interactive ways than raw data ever could. For more information about our fantastic map development work and how we can create a successful map driven application for your organisation, contact ExtraDigital today on +44 (0) 1227 68 68 98 and speak to a member of our team. We also provide a number of other services including website design, online marketing and hosting, more information about these services can be found on our website at www.extradigital.co.uk.